When we first started in 1996, eBikes were pretty sketchy compared to today. Back then, they had 25 pound sealed lead-acid batteries, external motors, and cheap bike parts. If you wanted one, it was an easy choice -- there were only a couple of choices, all in one color -- if you could even find one! But they were fun, simple, and an absolute blast to ride. Fast forward to the present day when there are scores of models from tons of vendors, in scads and slathers of configurations, complexities, colors, styles, and technologies. These days, shopping for an eBike can make you dizzy, frustrated, and truly wiggy. And all you really wanted was some fun in the sun or an alternative to your car. After evaluating the current models at the various eBike shows, I feel that most of the models seem over-engineered, too expensive, and too complex for most people. If you are a commuter or recreational rider, a proven Hub Motor with a Throttle is your best bet. If you are principally an off-road rider, a Mid-Drive might be a better way to go. Well, I’m here to share my expertise and try to spare you some grief. We all like getting a good deal and feeling confident in our purchasing decisions. I’ve always combed through and shaken down all the available models and just gotten behind my favorites. Here are my 10 standards which need to all be fulfilled. Balanced - No batteries on the rear rack ! -eBikes with cheap Batteries -- the most critical, expensive, and important part on the bike! -Used eBikes without a pedigree -- they have evolved rapidly. -Cheap Gas Bikes -- disturbing the peace in motion - like riding a weed wacker! Please remember: eBikes are like Smartphones, constantly being improved and upgraded. And make sure the company has been around for awhile, and again, make sure it has a high-quality (LiNCM) battery! 20+ years in the business, and I have become severely picky about finding high-quality eBikes which are affordable. Unless you've won the lottery, everyone is value conscious and wants to get a good deal and be delighted with their purchase. If you're principally riding on the street, do you really need an expensive mid-drive Mountain bike? I don't think so. Do you want to pay for all the overhead involved in the supply chain? 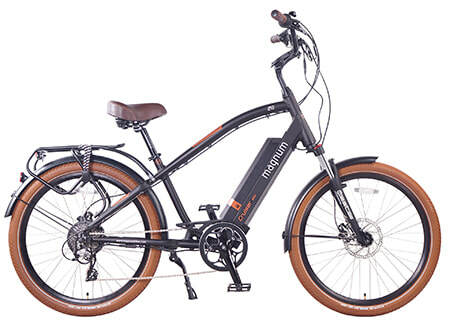 I've selected the best eBikes you can buy for your money, and will give you a great deal on yours! We only sell 'eBikes for Everyone' -- All under $2000! If you’re a newcomer to e-Bikes, a commuter/recreational rider, RV traveler, or an adventurer/enthusiast -- there is cutting-edge, attractive, and affordable model I am confident you will love. 2018 Magnum Metro and Metro +-- Simply The Ultimate Commuter. 2018 Magnum Cruiser -- Power, Comfort, Fun, long-range, quality. 2018 Magnum Peak - Power, long-range, ride anywhere. 2018 Magnum Premium 48 - The ultimate Folder - 48 Volt 500 Watt performance. 2019 eJOE Epik SE - All the performance of a full sized bike, but just 42 pounds and it FOLDS! 2019 eJOE Koda 3.0 - Hybrid-style sport bike with long range and high performance.